Google Analytics - How to See More Detailed Browser and OS Info at Same Time? I know how to see high-level browser, OS, and device info in Google Analytics. And I know how to see detailed info by category (i.e. IE > IE11, IE10, IE9, etc.). But how can I see detailed combinations? For example, within the list of OS (from most common to least), I'd like to see specific browser and version (e.g. Chrome 35.x) from most common to least. I can get these data separately and am wondering if Google Analytics has a way to automatically combine them for me. Google Analytics only allows two dimensions on standard reports at any one time. You are asking for a report with three dimensions (OS, Browser, Browser Version). 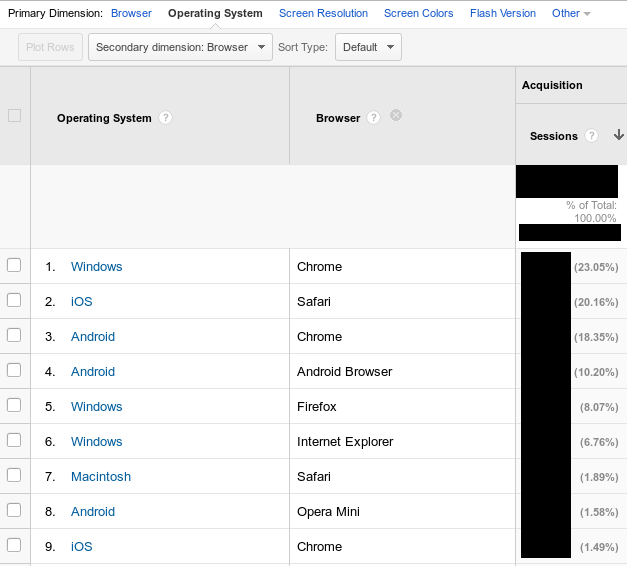 Starting with the "Operating System" report (from "Audience", "Technology", "Browser & OS"), you can add a secondary dimension of either "Browser" or "Browser Version". While neither of those reports do exactly what you want, the latter is pretty close because there is little overlap between browser versions between browser. I know that "39.0.2383" is a Chrome version, "11.0" is IE, and "34.0" is Firefox. I really wish that Google Analytics had a "Browser and major version" dimension concept so that you could actually see "Chrome 39" as one entity and as a single second dimension under operating system. Then you've got a report with number of sessions/users/pageviews per browser and you can drill down to see which browser is most popular on selected platform. Though, it won't help with historical data. Custom reports is one way of doing it. Another is to use the Google Analytics add-on with Google Sheets. Does Google Analytics track users with multiple languages? Is there a way to see granular per-visit data in Google Analytics? How to properly setup Content Groupings in Google Analytics? How to track a product filter in the product list view with Google Analytics?